← Is “Proofread Fail” hyphenated? 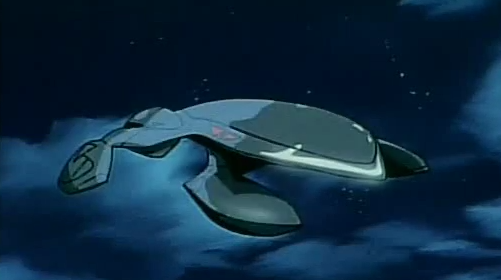 My most recent video fare has been a big plate of nineties anime nostalgia called The Enemy’s The Pirates!, a six-episode OVA series from 1990 based on a series of books that I’ve never read. My interest in the series, therefore, comes entirely from having seen the name of the series on various tape traders’ lists of anime way back when – it’s just one of those names that stands out in a list. I never did get a chance to watch it back then, of course, because you had to be terribly careful in the numer of tapes you were asking for and other stuff always took priority. The USPS could only get packages of VHS tapes through the mail so fast, after all, and you were usually bugging someone who had a real life that didn’t involve copying tapes 24 hours a day. So, when I found a nice modern digital version of it for download, I figured that I would finally get to satisfy my curiosity. An anime series based on a series of books does, unfortunately, inherit all the issues that implies, such as being expected to know the characters and their backstory before you start watching. After all, who would be dropping a couple hundred bucks on the three LDs that made up this series if they weren’t already a fan? Not knowing the characters or situations, therefore, I really had trouble getting into the show. The first couple of episodes introduce the main characters – two pirate-hunting detectives, one a girl-chasing gun-crazy loon and the other a cat-shaped walking stomach, their boss who hates them, a ditzy sidekick who wants to become a detective, a couple of pirates who majored in Dramatic Posturing and a perpetually-annoyed ship’s AI. People shout a lot and the main character just randomly shoots things while he and his partner yell at each other. It’s like every bad cop show parody ever rolled into one, with the schtick being that they’re supposed to be hunting pirates… who aren’t really doing anything all that piratical. For the “bad guys”, they don’t ever really give you any reason to hate them except that they would presumably stop the Dramatic Posturing if they were dead. After the series gives up any pretense of sanity, it gets a lot more fun – even if the story never really reaches any real resolution. A couple of the pirates get caught or killed, one of the Bigger and Badder Pirates gets away to posture another day which is probably much more significant if you’ve read the books and overall it’s not a great way to spend three hours of your life. It did finally satisfy a couple of decades worth of vague curiosity, though, and I got a nice extra hit of nostalgia from seeing a credit given to SV2 for the translation script. Dave Fleming’s Nadia and 3×3 Eyes fansubs were some of the first I watched back when, and seeing “SV2” again was entirely unexpected on something I was watching in 2013.